Inspired by the Samurai Katana, this Black Dueling Dragon Katana features a hand-forged carbon steel blade built Samurai strong. 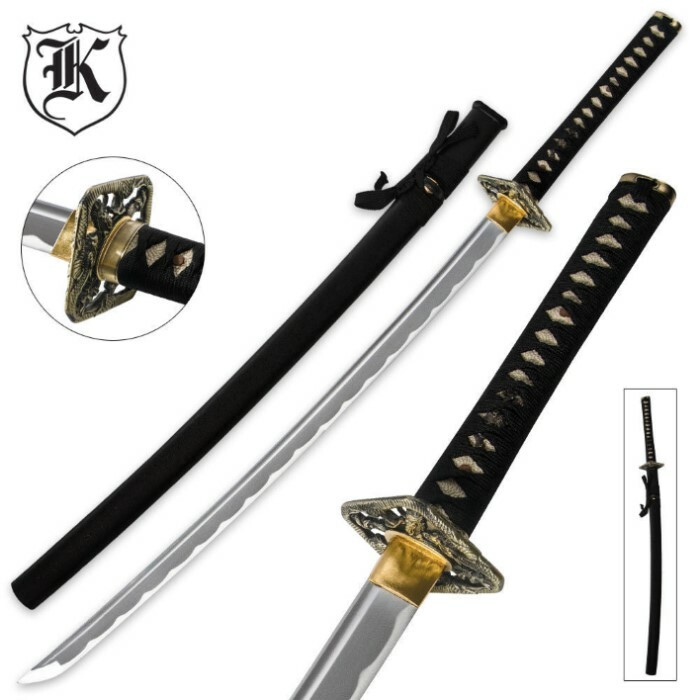 The 30"" blade is intricately hand forged and meets a custom cast zinc alloy tsuba with an ornate dragon design. The embellishments are antique-finished as well as the cast menuki and pommel. The handle features imitation ray skin and is wrapped in heavy nylon cord. A coordinating wooden scabbard houses the blade. Awesome piece for the money. Showed up well packed and protected.The blade was not razor sharp, but the nice kind of sword sharp that will prove more durable in the long run. Very little looseness in the tsuka and tsuba, just the tiniest bit of wiggle and not at all a big deal.Made a number of test cuts and nothing shook loose. Double pegged handle feels solid. The only gripe was that the wrap was very loose and shifted quite a bit after a couple of cutting sessions. I decided to go with a premium baseball bat grip tape in black and it looks pretty good while greatly improving grip and cushioning. Not exactly traditional, but very functional and if you're worried about tradition, why are you buying this anyway? You will not find a more reasonably priced practical Katana and it would have gotten that fifth star if I hadn't had to re-wrap the grip. Just received my sword today and I must say I'm really impressed. The blade arrived very sharp and battle ready double pinned handle very impressive for the price. Good weight and really tough well made. I just received the sword,I brought this due liked what it looked like and the price was great and have had good luck with ten ryu swords befor.The habaca was little louse but can fix that the tsuba was little louse can fix that wrap was fairly tight,love the duling dragons tsuba.The fittings are nice,the blade is nice with light nuki,the edge has no 2nd bevel,so if youwant to sharpen can be done with sand paper.The bladis is 26 3/4 long,handle suka is 103/4 over all 39.Cuts thin and regular typing paper front and back well.love the color of the scabble.customer service was great.Should make a good light cutter,maby a single mat cutter.Over all happy whith katana.